37, 37, 37 are the numbers, what numbers? 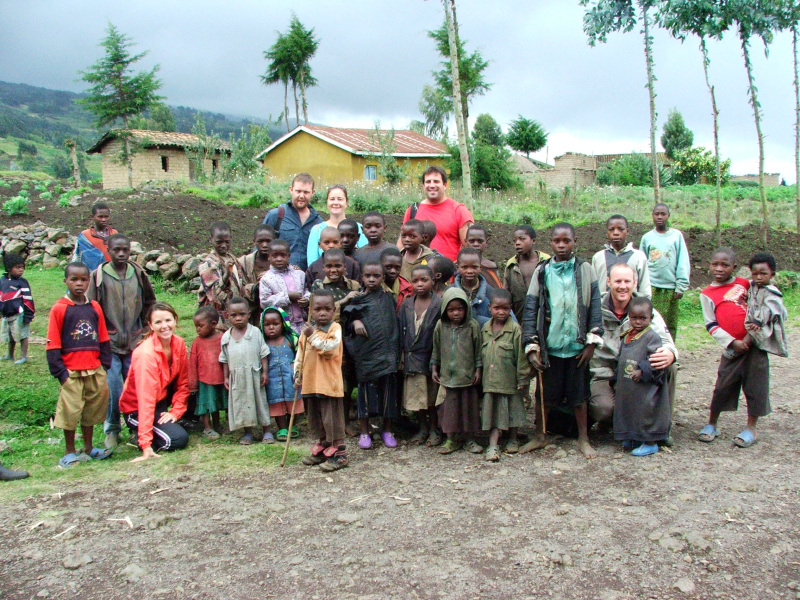 Somehow without thinking, discussing or planning, we spent 37 nights in Ethiopia, Kenya and Uganda. This pattern was not to be followed in kidogo kidogo Rwanda, 10 days was enough to see all it had to offer. On arrival over the border from Uganda, immediately there were differences; French speaking, unpacked buses that leave on time, lush green valleys, quite unassuming people, tea plantations, Rwandan francs, left hand drive, some men with scars on their faces, many young kids, waterfalls, rain and lots of it, cultivated terraced hills and people walking everywhere. Quite different to other East African countries. Kigali and it’s thousand hills or milles collines offered up a struggle on the legs and lungs, good preparation for the gorillas. I have never been so glad that I gave up smoking in September! It is a clean city with good roads, no street sellers, no street food – both resulting in a hungry Jeanne and Jon as the food was dire. Well maybe not if you like salty gravy stuff on everything! And if you like bread, bananas and chips. Although that said Rwanda frites are said to be the best in Africa. Fruit magically grows legs and heads for a holiday over the border to the DRC. I hear Goma these days is meant to be a good spot for a weekend. Mory an Irish friend of a friend gratefully showed us what beers were good and we downed a few with her and Matt. Jon with the largest smile yet when a large Primus beer of 72cl, cold, was placed in his mitt. 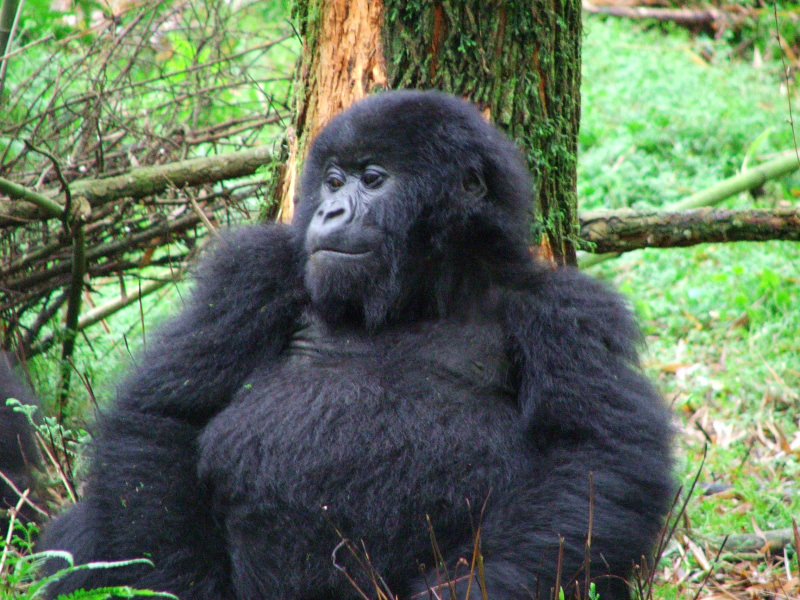 So what is Rwanda best known for, gorillas or genocide? 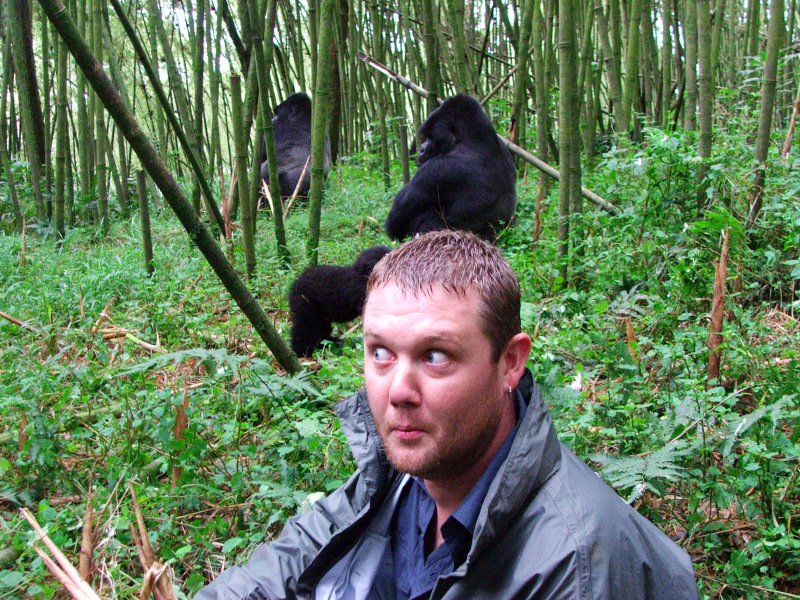 I am hoping it is gorillas and that was one of the main reasons we were here. 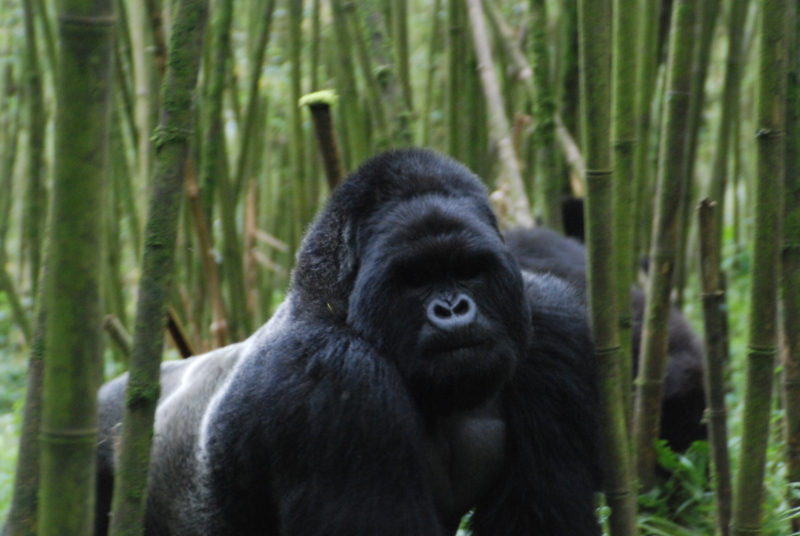 I had been excited for weeks about seeing them in Parc Nacional des Volcans. 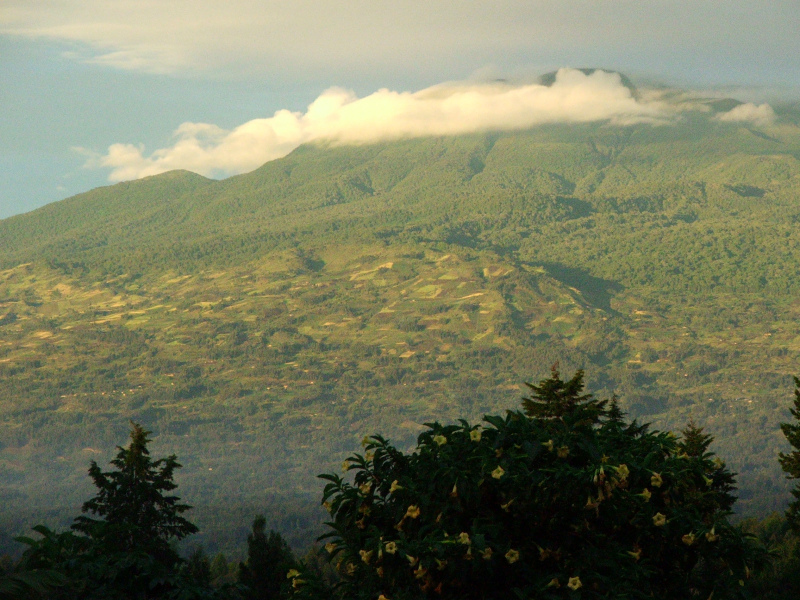 The very pricey sum of $500 was paid each for a permit and off we went on the windy roads to Ruhengeri. Armed with rain jackets and thick socks, I was ready for anything, bar the steep incline of a walk up to the park boundary. Finally after about an hour at an altitude of 2,600m I reached the boundary wall red faced and struggling for breath. Immediately on entering the park itself the landscape changed to thick bamboo forest, eucalyptus, nasty stinging nettles, wet and slippery underfoot. Each step had to placed with care. The trackers ahead slashed a path for us, whilst an armed ranger kept an eye out. Suddenly after another hour, there they were. Incredible. 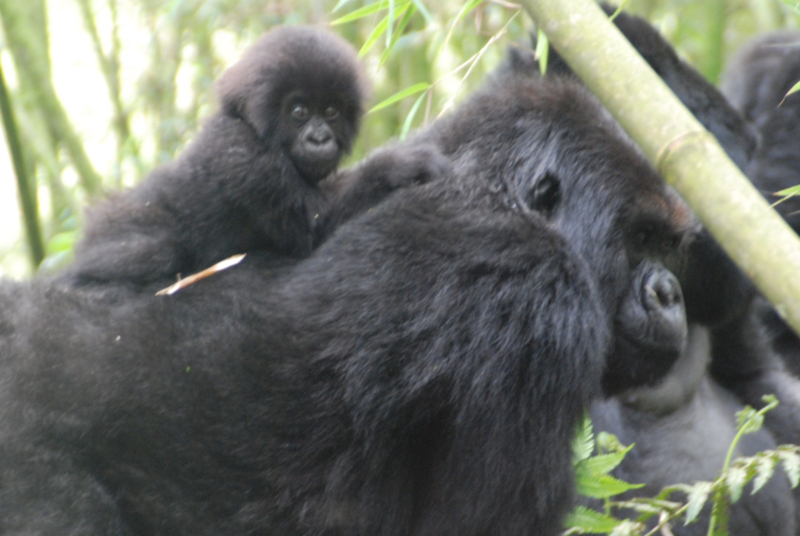 The Susa group consists of 41 gorillas; 5 silver backs, juveniles, black backs, females and babies and I saw them all. Just metres away from us and at once stage a little too close when a silver back brushed by us, maybe one foot away. Heart thumping material. 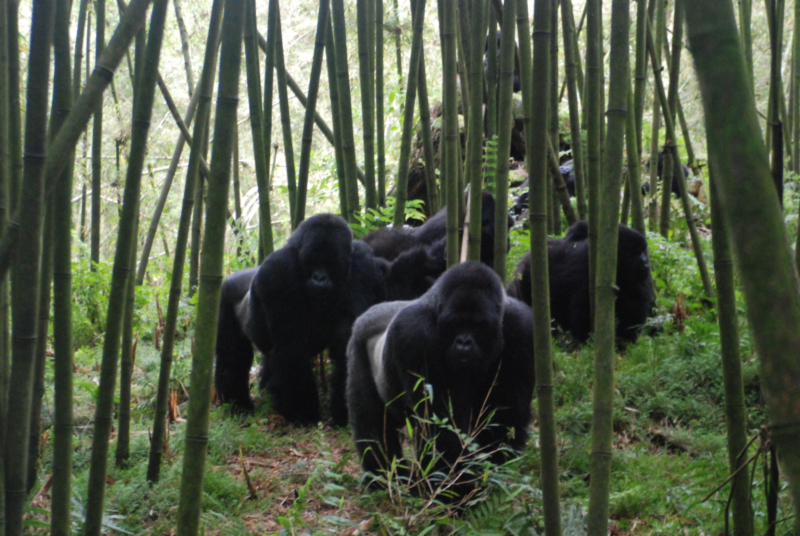 I smiled as soon as I saw the first black back just chomping on the young tasty bamboo shoots and smiled in awe at them for the hour. They played, tumbled, chased each other, beat their chests. So muscular, so powerful, so beautiful and so huge. And then a baby of three months clinging onto it’s mother’s back passed right by us, it’s huge eyes wondering who we were. An hour is all you get and not a minute more but I didn’t need a minute more as their images will be in my head forever. A day I will never forget. Gorillas done and genocide memorials seen, it was time to move on. It was a timely moment to be in Rwanda as it was the 15th year anniversary of the genocide. A reality check sinks slowly into my brain and the sadness of the genocide reality is even slower to leave. 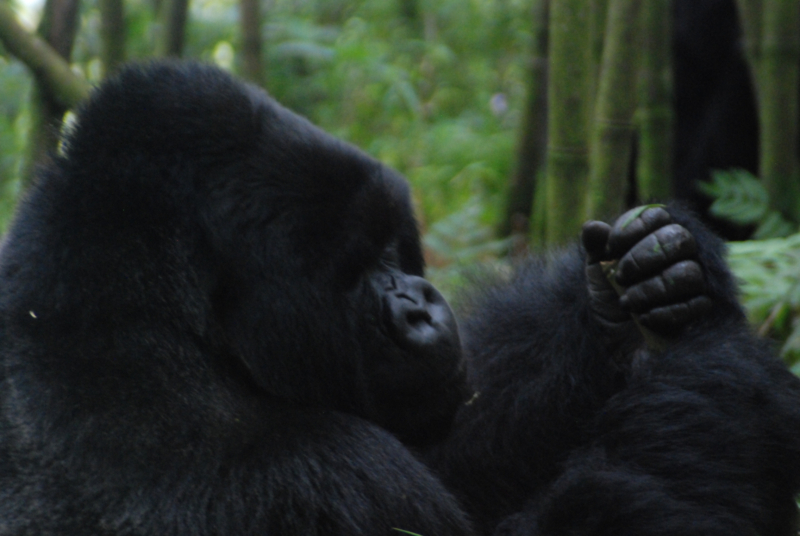 Rwanda in many ways is a country of contrasts, for me the highest point of my travels of seeing the gorillas and the lowest point of visiting memorials and talking to survivors. I leave Rwanda full of sadness. The most densely populated county in Africa and perhaps the world is by far the quietest country. I wonder why but think I know the answer.